Published: Dec. 31, 2013 at 02:26 p.m. 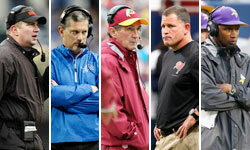 Updated: Dec. 31, 2013 at 07:12 p.m.
Over the past four seasons in the Washington Redskins' front office, Mike Shanahan called the shots with general manager Bruce Allen as his first lieutenant. Now that Shanahan and his coaching staff have been fired, Allen will fill the power vacuum as the new football czar even if his title remains unchanged. "The control will be mine," Allen said with authority Monday. Allen will work closely with director of player personnel Scott Campbell and director of pro personnel Morocco Brown, the latter of whom interviewed for the Arizona Cardinals' general manager position last offseason. Previously the general manager of the Jon Gruden-era Tampa Bay Buccaneers, Allen will implement his own philosophy rather than follow Shanahan's blueprint. "We are going to redefine some of the characteristics that we're looking for in players," Allen said, via ESPN. "Obviously when we have a new head coach there will be some schematic adjustments that we will make, but that power will be with me." Although owner Daniel Snyder has led the coaching search in the past, Allen will run the show this time around. "My job is to put the Washington Redskins organization on the right track," Allen said. "And to continue to build the foundation for this team to win, and it is my job to find the next head coach for the Washington Redskins."